I love the slow cooker. I love how the most simplest of recipes take little effort and yet taste so good. 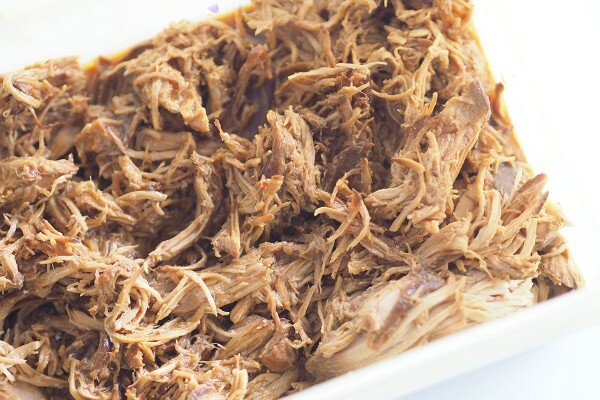 This Slow Cooker Shredded BBQ Chicken recipe is one of those. My kids have very busy after school schedules, sport, scouts and other activities. There are evenings that it’s impossible to have the time to cook as I am too busy being Mum’s taxi. On these nights we have left overs, where I make a double batch of dinner the night before, something quick and easy like eggs on toast or a slow cooker dinner. Simply place chicken breasts into the slow cooker, then mix remaining ingredients into a jug, then pour over chicken and cook for 8 hours. The chicken is very easy to shred after cooking all day. 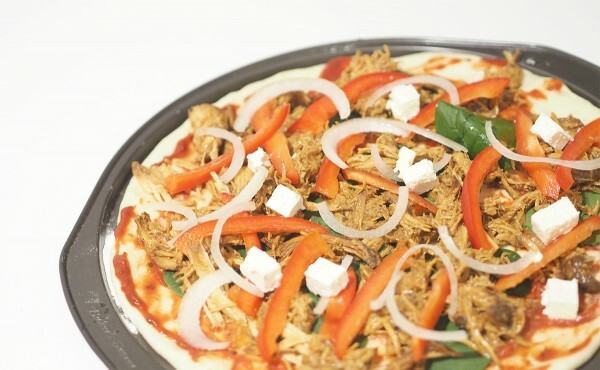 I poured all the sauce over the shredded chicken which gives it plenty of flavour. I served it on bread rolls with lettuce and cheese as a quick dinner. 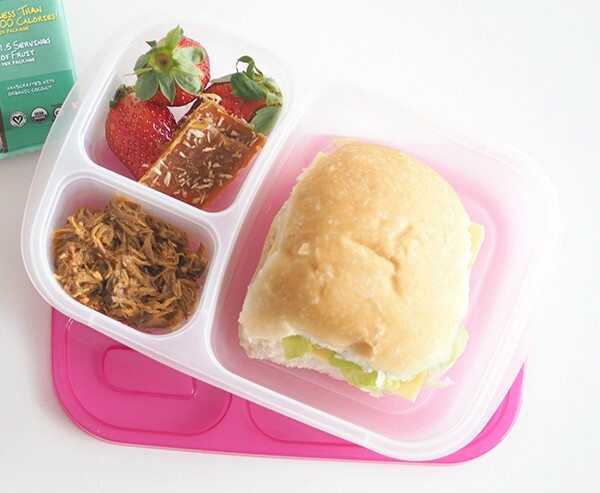 There is so much left over enough for the kids to have it on a roll for lunch the next day in their school lunch boxes. I squeezed out some of the juice and put it in one of the compartments of the lunchbox so the kids can then spoon onto the bun at lunchtime. This lunchbox is available here. And then I made BBQ Chicken pizza’s for dinner the next night. You could possibly halve the recipe, but I love the convenience that it can feed us for a few meals! 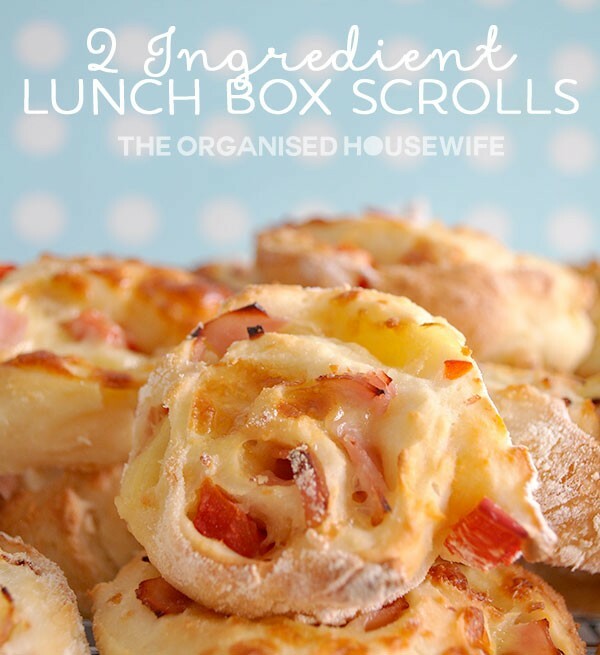 2 Ingredient lunchbox scrolls – If you want to make some fresh scrolls for lunch at home or lunch boxes, this is a really fast and easy recipe. Equal parts self-raising flour and greek yoghurt, that’s it!! View recipe here. 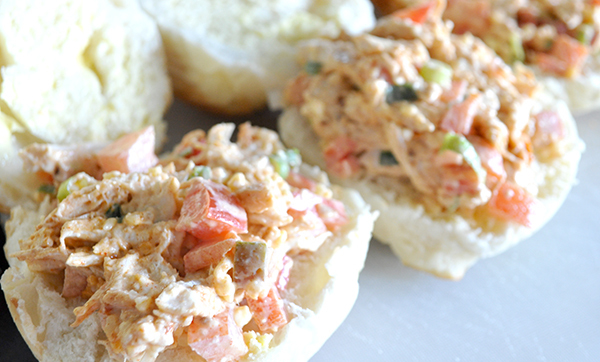 Mexican Chicken Rolls – Ooh we so love Mexican in this household. The girls and I like most dishes as I make them, but the boys (so macho) like to add in extra dashes of chilli sauce or jalapenos. We often have chicken rolls for lunch on the weekends, but this took the traditional chicken and mayo roll to a whole new level. If you love Mexican you must try this! View recipe here. 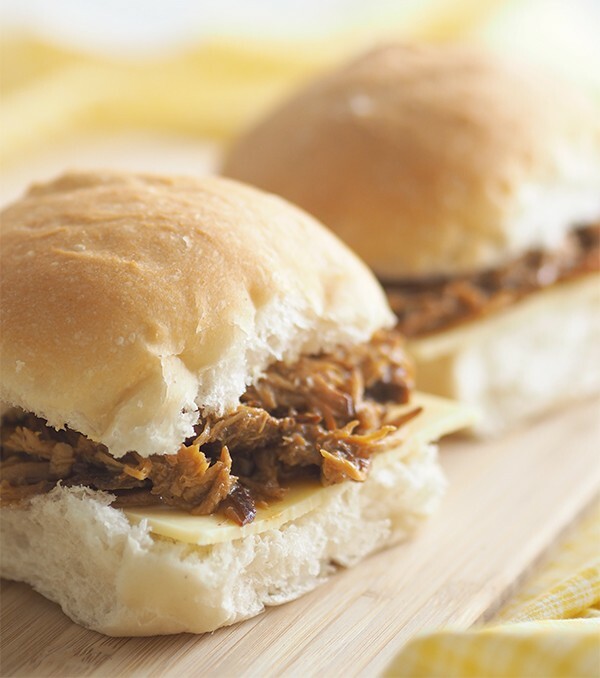 With your slow cooker shredded chicken recipe, do you defrost the chicken breasts first? I’m thinking that might be a typo, I’ve read you shouldn’t put any frozen meat in a slow cooker – I could be wrong tho! This is so easy and versatile thank you. Could I use fresh fillets and halve the cooking time?? Hi Michelle, You can use frozen or fresh, but cook both for 8 hours on low. I’ve made it with both same times and just as delicious as each other. Sounds delicious, will definitely try this recipe! As chicken breasts vary so much in size, would you mind telling me approx what amount of chicken you use in weight (kilograms)? And also I’d be interested to know whether you put the chicken in slow cooker frozen or once defrosted too?? Many thanks. Hi Kelly, each breast is roughly 250 grams each. You can use frozen or fresh breasts, but cook both for 8 hours on low. I’ve made it with both same times and just as delicious as each other. Similar to a french salad dressing, can be found in the aisle at the grocery store with mayo. If not using slow what options are available? 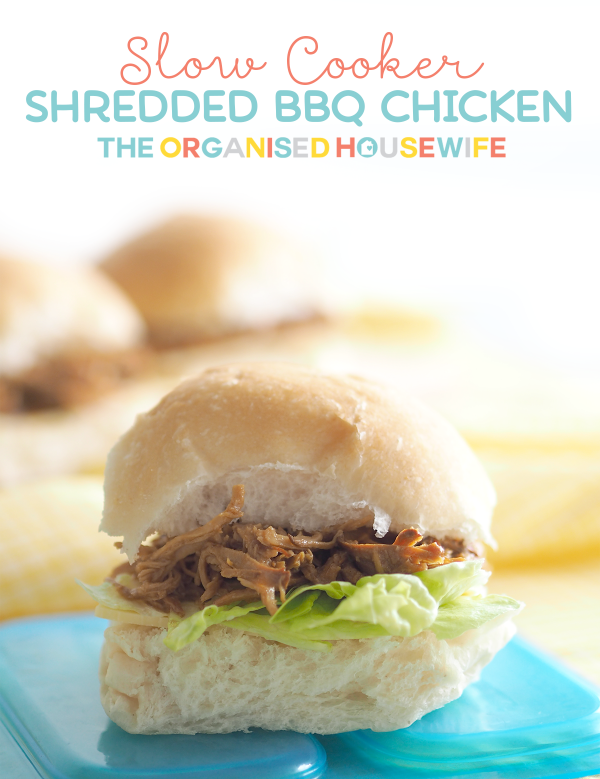 We made the BBQ shredded chicken today. Oh YUMMY!!! It was sooo good!!!!!! We served it with salad (because I’d taken a nap instead of cooking veggies and rice like I’d planned! Haha!) and it was super delicious!!! There are 6 of us in our family and there was at least half of the shredded chicken left which I’m freezing in portions for lunches and pizza toppings. Thanks so much for the fab recipe!!! Absolutely awesome! Do you shred the chicken with a fork or put it in a blender? I’ve just put the chicken on to cook! This recipe is fantastic…love it! I cooked this chicken from frozen just because I failed to plan. I cut the BBQ sauce back to 1 cup and used a little less sugar too. There was still lots of sauce so I took the lid off the slow cooker near the end of the cooking time for around 20 mins and this reduced the sauce quite a lot. Have restocked my chicken breast supply for this week and going to make it again – thanks for sharing. Can the leftovers be frozen? Do you happen to have a thermomix version for this? Hi Natalie, no I’m sorry I don’t have one. I’m hoping this would work if I put my slow cooker on high instead of low! ?